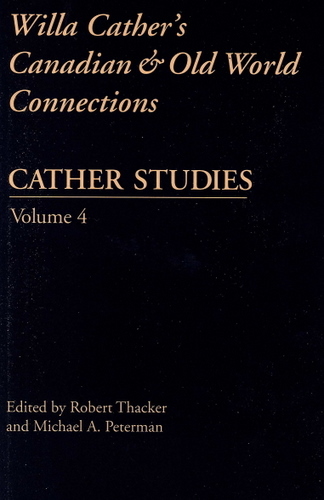 Contains eighteen essays and elaborates a theme, "Willa Cather's Canadian and Old World Connections." Such connections are central to Cather's art and artistry. She transported much from the Old World to the New, shaping her antecedents to tell, in new ways, the stories of Nebraska, of the American Southwest, and especially of Quebec, in Shadows on the Rock. David Stouck details Cather's numerous Canadian connections, Richard Millington treats her "anthropological" re-creation of the cultural moment of seventeenth-century Quebec, and Francois Palleau-Papin finds "The Hidden French in Cather's English." A volume of lively and informed criticism, Cather Studies 4 vividly demonstrates Cather's artistry and her work's deep connections to the present cultural and critical moment. Robert Thacker is the director of the Canadian studies program at St. Lawrence University and the author of English-Canadian Literature. Michael A. Peterman is chair of the English Department at Trent University. His works include I Bless You in My Heart.